I have worked in the Rugby property market since 2002 and became a manager very quickly due to the passion I have for getting the job done. I have very high standards, especially when it comes to the client’s customer service, advert and marketing. I believe that a large part of an estate agents’ job is marketing. The pictures, floor plan and description must be the best that it can be- this will give us the highest chance of gaining viewings for our sellers. My market knowledge stretches across Warwickshire with direct experience in Rugby, Leamington, Coventry and surrounding villages over these years. 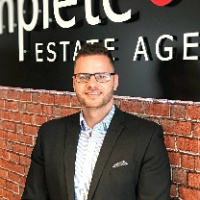 I have managed an upper market estate agent in Leamington and have chosen to start the Platinum Collection for Complete which will put my experience and passion to the test. I love my job, I don’t feel like I am working and the spirit in my office is of fun and professionalism, I tend to work late and get in early just so I have enough hours in the day.